For residential window cleaning in Peppermint Grove and surrounding suburbs, trust CCC Window Cleaners. 1300 72 87 72. 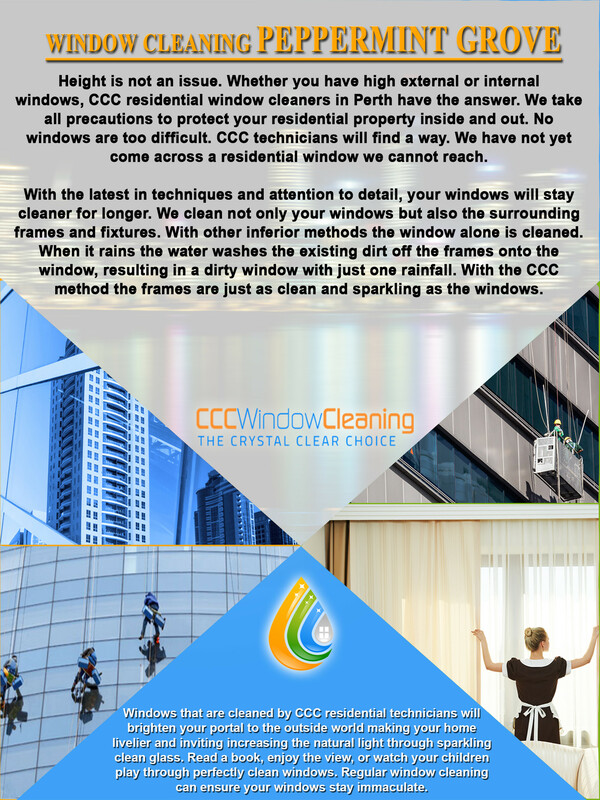 CCC in Perth will leave your windows immaculately clean. For top notch residential window cleaning in Peppermint Grove contact us today! We clean windows for some of Perth’s most prestigious businesses and residential properties. Height is not an issue. Whether you have high external or internal windows, CCC residential window cleaners in Perth have the answer. We take all precautions to protect your residential property and inside and out. With the latest in techniques and attention to detail, your windows will stay cleaner for longer. We also clean the surrounding frames and fixtures. With other inferior residential window cleaning methods the window alone is cleaned. When it rains the water washes the existing dirt off the frames onto the window, resulting in a dirty window with just one rainfall. With the CCC method the frames are just as clean and sparkling as the windows and the windows therefore remain clean after it rains. A new technique among window cleaners is called ‘pure water window cleaning’. With this technique pure water is used to wash the windows and the surrounding frames with specialized equipment. Since the water is pure and free from any contaminants, it dries crystal clear. Window cleaners either purify water via reverse osmosis or De-ionization water thereby removing all spotting ions from the water resulting in a spot-free, smear-free finish. Windows that are cleaned by CCC residential technicians will brighten your portal to the outside world making your home livelier and inviting increasing the natural light through sparkling clean glass. Read a book, enjoy the view, or watch your children play through perfectly clean windows. Regular window cleaning can ensure your windows stay immaculate. Our residential window cleaners never show up uninvited. We use a ‘by appointment’ system and always text, phone, or email to confirm regularly scheduled cleans and we use an online ‘live time’ job planner to ensure our residential window cleaners are punctual and carry out tasks according to your specifications. For a reliable and absolutely professional residential window clean in Peppermint Grove and surrounding suburbs.